In this recently opened park, laid out on a slope leading down to Drogenbos and the Senne valley, you can walk to your hearts content along winding paths. On summer days, Frankveld Park with its vast lawns is the perfect setting for a nice picnic. The park can be accessed from Ukkelsesteenweg, Dachelenbergstraat and Landhuizenweg. The park and natural reserve Schaveyshoeve is a forest with typical hollow roads. This marvellous piece of nature is located in the eastern part of the municipality, on the border with Linkebeek and Sint-Genesius-Rode, an area that is particularly rich in natural springs. The Woods of Beersel used to be part of the ancient Charcoal Forest, today known as the Sonian Forest. It is therefore hardly surprising that Beersel is a green municipality. It is dotted with forests such as the Dwersbos in Beersel, the Gasthuisbos in Alsemberg and the Begijnenbos and Hanenbos in Dworp. At the far southern end of Beersel lay the Krabbos and the Kesterbeekbos. These forests are both offshoots of the much bigger Hallerbos, which is largely situated on the territory of the city of Halle. 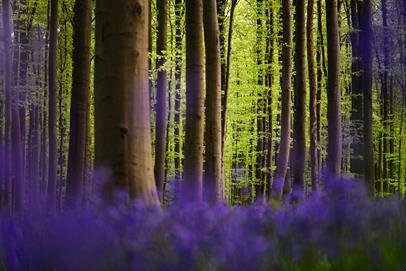 The Hallerbos is mainly known for its typical wild hyacinths, which cover the forest floor in spring to create a breath-taking, bluish-purple carpet.